Time to talk about my WIP again! I never used to do this at all, as the thought of giving the dreaded “elevator pitch” makes my stomach churn like too much greasy pizza too close to bedtime. But like anything bearing the label “dreaded”, said dread is usually lessened over time through devoting regular thought and effort to improving at the task at hand. In other words, I need to practice pitching and promoting myself more. Which is why, when tagged by my blog-buddy Eric J. Baker, to answer four questions about my WIP as part of the Writing Process Blog Tour, and I agreed to participate. 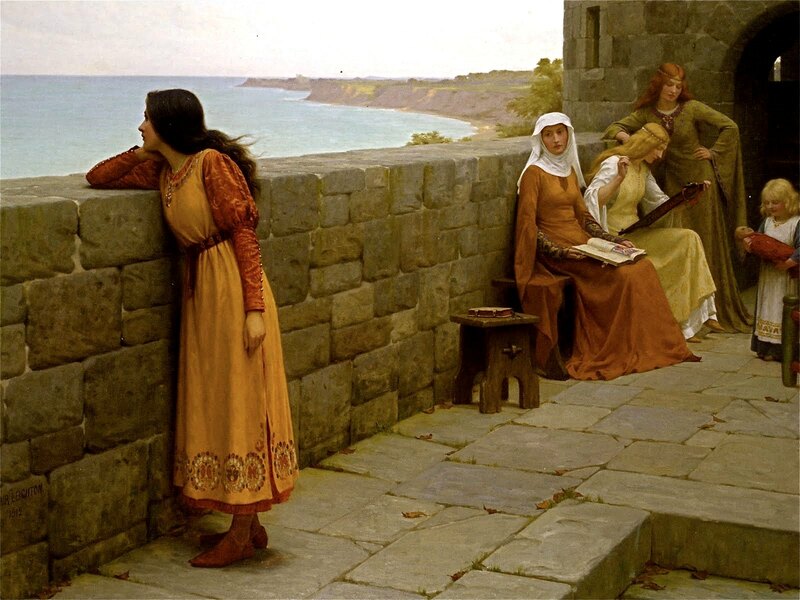 The Hostage, by Edmund Leighton (1852-1922). The visual inspiration for my WIP. Earlier this year, I tried my hand at writing a summary for my WIP, which I posted on my “About my novel-in-progress” page on this site. However, according to a post on creating loglines at the blog Writers in the Storm (linked in Eric’s Writing Process Blog Tour post), a logline is a synopsis of your novel of only 25 words. In Medieval England, a knight’s daughter employs political dexterity, witchery, and treachery to escape her abusive father, and discovers the true meaning of loyalty and duty. I’ve been working on this project for a few years now. I was hoping to have the first draft finished by my birthday last year, however, the story has grown in the telling. Having already once grown from one book to two, I recently concluded, upon reaching the milestone of page 400 in book 2 and still having another 100 or so pages to go, that I am, in fact, writing a trilogy. Good things, it’s said, come in threes. I sure hope that is true! As a work of historical fiction, my novel takes place in 13th century England (i.e. Medieval) whereas much of what I see published these days deals with the 16th century (which is actually the Tudor period). Also different is that I have no main characters who are actual personages from history, for I’m more interested in making a main character of the historical era, which is best allowed to shine when not paired with someone from history whose life is already well-known. It also contains magic realism since, in its earliest iteration, it was a fantasy story, and some fantasy-ish elements of that just worked within the context of 13th-century superstitions and historical fiction in general. I write historical fiction and fantasy-ish things for two main reasons. The first is because I was raised on the stuff, and it’s romanticized (mis)representation of flowing dresses, swords and chivalry, unspoiled nature, localized evil, and idealistic heroism has infected in brain like those alien earworms from Star Trek II. That is to say, because I love it. The second reason is to make a more palatable statement about aspects of modern life that I dislike, most of which have their origins in ancient history since we humans seem to like recycling the same societal mistakes over and over again. I like using history to draw these parallels as a way of (hopefully) bringing awareness to issues that matter to me. I write in the evening after supper. I always unplug my modem while doing to so to prevent internet distractions. I tend to fuss over my writing at a sentence level. I’m very particular about word choice and rhythm, and, at least for this project, have decided to spend the time upfront determining the correct words and flow rather than using placeholders and trying to figure out what I actually meant during revision. I always write the most just before its time to stop writing; I start slowly but finish strong. Overall, I’m slow and my first drafts go long. My name is Janna G. Noelle, and I’m a writer. The three people I’m going to tag to answer the same four questions (and it’s entirely up to them if they choose to participate or not) are Dianne Gray, Kay Camden, and Ciara Darren. Writers: What are you currently working on? What’s your WIPs logline (a summary of approximately 25 words)? Readers: What’s the logline of a book you love? Let me know in the comments. This entry was posted in Writing and tagged Fantasy, Feminist fiction, Historical fiction, Ideas, Magic realism, Marketing, Medieval times, Novel, Novel writing, Page count, Plotters vs. Pantsers, WIP plot summary, Writing inspiration, Writing milestones. Bookmark the permalink. It is a nightmare, Dianne. I’m still not happy with what I’ve come up with, but for now I’ll focus on just getting the novel(s) done! You have to climb to the top of the mountain and sing out about novel. There’s to much competition out there to be humble. If you are apologetic, people will assume you have a reason to be. I’ll sing so loud and proud, I’ll cause an avalanche! Whoa, what? Me? Little ol’ me? I’m eagerly awaiting reading your epic Janna, though it seems a little way off yet. A couple of observations/questions on writing historically if I may. 1. Would you not say that in the 13c there are very few characters who are known to us in great detail. Would this not give scope for some creative, maybe mischievous, speculation? (Author/blogger Naomi Baltuck had King Harold escaping the battlefield, reappearing to lead the Saxons). 2. I read somewhere recently (quite possibly you said this!) that the common idea of chivalry towards women in medieval times is completely wrong. OK if you were a high-born lady or princess, but generally women were abysmally treated. Do you have a view on this? I promise, Roy, it will be worth the wait, but patience is definitely a virtue when it comes to my writing (both for me in finishing it and anyone wanting to read it). 1. I agree, a lot more has been made in mainstream media (books, TV, etc.) of, say, King Henry VIII’s court (16c) vs. that of King John (13c). However, I’ve always been less interested in historical figures than the societies that gave rise to them, of which they are irrevocably a product. My novel does involve the actions of a few key people (King John, William Marshal, a few important magnate the average person may or may not be familiar with), but none of them receive any “screen time”, which was a deliberate choice. 2. Absolutely agree! The notion of chivalry was largely a literary genre (literary as in poems, ballads, songs, etc.) from France kind of like how YA dystopian is a modern genre. It had its various genre conventions and its “fandom” for lack of better term, but wasn’t reflective of real life at all. A woman was the property of a man – either her fathers, husband, or whatever other man held the burden of her care (which could be bought and sold like a commodity) – and had very few rights under the law against abuse and neglect. Her only real salvation was if husband happened to be kind (most men weren’t known to be especially kind in the Middle Ages, at least not publicly) or if he died in battle, although that came with a host of other problems and challenges. I discuss the treatment of women quite a bit in my novel. You whetted my appetite for your book in a previous post, and now you’re doing it again. I especially look forward to your commentary on modern issues, costumed in their roots at a centuries-old setting. I can’t imagine how you can “spend the time up front.” I dump my words, trying to keep up with my thoughts. Later, I assemble and tailor it. If you would like more practice pitching and promoting yourself, I would like to offer you an opportunity to participate in the Meet My Main Character Blog Tour. I received an invitation, and will respond in one week. Please let me know whether you would like me to include you in my response. Spending the time up front is the only way I know how to write at the present time. My ideas aren’t occurring to me fast enough to dump out, so I’m making a point of saying what I actually mean in this draft. In subsequent drafts, I’ll ensure that I actually mean what I say. Thanks for the invitation. A couple weeks ago, I would have said yes, but my last two posts have been included overviews of my WIP, so I feel I should now give that a break for a little while until I’m closer to actually being finished. It’s purely a matter of timing. BUT, I’m definitely interested in checking out some of the entries of this blog tour, yours included. I presume it’s geared toward historical fiction only? I’m always keen to meet other writers of that genre. What historical era do you write about? Thank you for considering my offer, Janna. I understand the need to pace oneself and let go of opportunities, knowing that more opportunities are coming. Tune in on Monday June 16 for my episode of the Blog Tour. I will definitely come by to see your post!